Cambridge features a Tim Liddy designed championship 18-hole golf course artfully etched into 170 acres of gently rolling Indiana farm land. Multiple tees, target landing areas, in-play lakes, formidable grass mounds, demanding bunkers, and finely sculpted bent grass greens highlight this challenging 7,200 yards Scottish-style links course. There is a risk/reward design philosophy throughout the venue. Please call 812-868-4653 for current rates. Call 812-868-4653 for rates and tee times. Contact Cambridge Golf Club at 812-868-4653 for more information and details on holding a golf outing at the course. Contact Cambridge Golf Club at 812-868-4653. 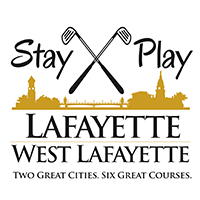 Contact Cambridge Golf Club at 812-868-4653 for onsite or nearby dining options. This profile was last updated on 08/15/2018 and has been viewed 8,835 times.